Spectra Galaxy JA 256/30pl AAA print head is widely used for commercial and industrial print jobs requiring multiple printheads tightly spaced at resolutions of up to 900dpi, including wide format graphics, packaging and addressing. 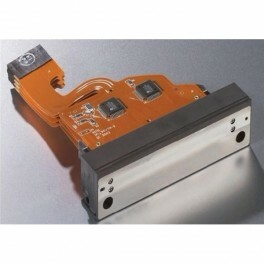 In Spectra Galaxy JA 256/30pl AAA print head, the 256 jets are comprised of 64 addressable channels within four electrically independent piezoelectric slices. Nozzles are positioned in a single line with 0.010c spacing between. Compatibility with an extensive range of fluids makes the Spectra Galaxy JA 256/30pl AAA prin head a versatile addition to any commercial or industrial setting requiring flexibility with mounting positions. Fast changeovers are made possible by dual-ported fluid interface capable of displacing drying fluids with inert fluids when not in production. Spectra Galaxy 256/30pl jetting assembly boasts serial-parallel converters used to determine which jets to initiate; both simultaneous and individual activation are possible. The optional Head Interface Board used in Spectra Galaxy JA 256/30pl AAA print head allows users to daisy-chain image data into one serial stream to minimize data interface hardware requirements. The pumping chambers inside each channel are actuated by a high voltage fire pulse with controlled slew rates. Temperature control components are optional and are available for accurate control of fluid viscosity.